Our “Hounds” history from 1979 to 2010. 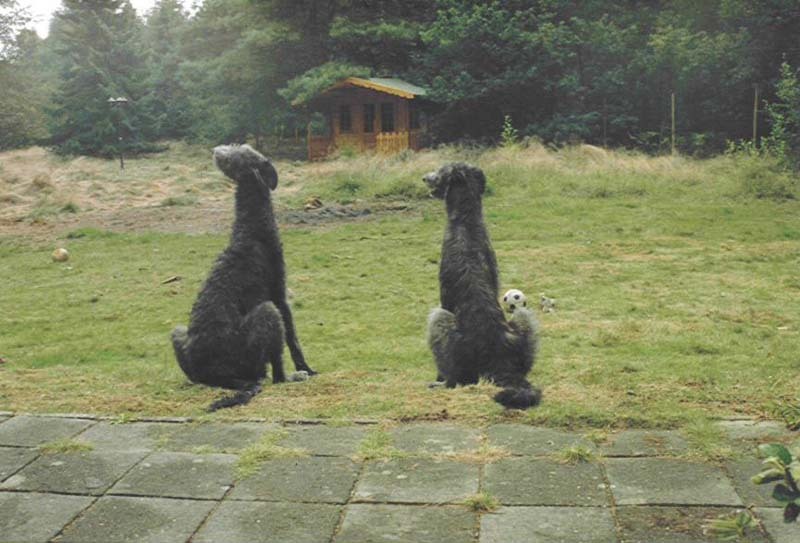 The Deerhound standard in word and image. What and how is a Deerhound. “Magic Meat Balls” or “Satin meat balls” recipe. The older Deerhound: based on our old Amy. Precious genes – why is the diversity of genes so important to our dogs? Plants, flowers and other plant things that can be harmful to our hounds. National coursing calendar 2019 and links to the organizing associations. How becomes my hound a Champion? How do I get a coursinglicentie for my hound? How is the (Inter-) National Sighthoundsport controlled? A Second Career For All Those Ribbons And Rosettes. 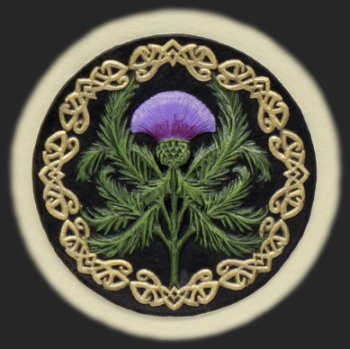 A second life for the engraved plates. A second life for the marble feet of the cups. Flora and fauna Law concerning Stray dogs. This book, 456 pages thick, includes the era 2000 to 2015. All champions, Deerhounds who have written history, club history and much more, are in it. 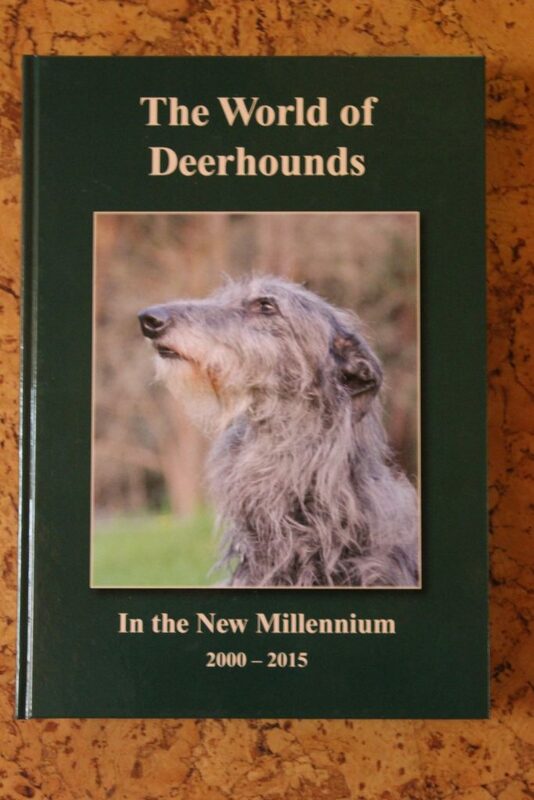 All countries that have a little Deerhound history have made a contribution so it is a very interesting book. A real collector’s item! My thanks go to Sonja Hansen who is improving the German texts for me. A number of texts have already been translated into correct English by Richard Hawkins and Vanna Condax, for which I thank you so much! But it will take some time before everything is corrected and if you still encounter strange things or errors, I would like to hear that. 20-3-2019: Recent – Precious genes – why is the diversity of genes so important to our dogs? 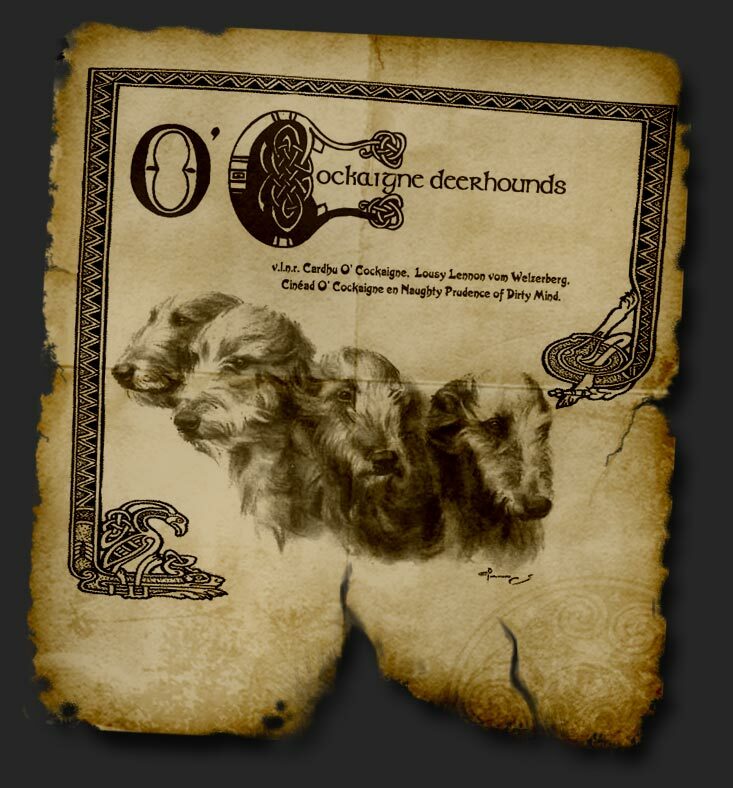 “O’Cockaigne” is the kennel name I requested, Caroline van Zanten-Boomgaard beginning 1992 to give our future Deerhoundpuppies a nice name. The word “Cockaigne” or “Cockayne” is of origin medieval low Germanic and was written as “Kokenje” with the meaning ‘sweet biscuit’. Via the Old French – ‘Pays de Cocagne’ which literally means ‘land of biscuits’, it comes in the middle-English as ‘Land of Cockaigne’ with the meaning ‘Land of milk and honey’. 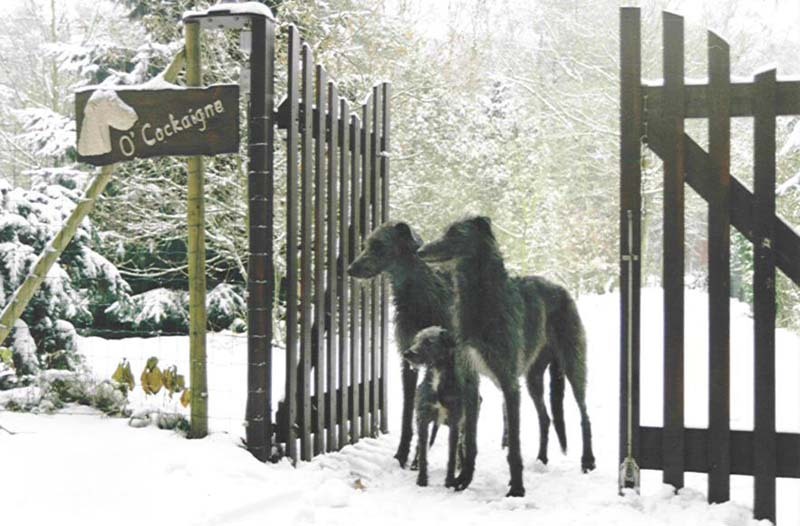 And I say it myself; we and therefore our Deerhounds, live in ‘Land of milk and honey’ indeed.